Germany’s leading economics research institutes have revised their forecasts for economic growth in 2019 signifi­cantly downward. They expect Germany’s gross domestic product to increase by 0.8%. This is more than one percentage point less than in autumn 2018, when the forecast was still for 1.9% growth. In contrast, the institutes confirm their previous forecast for the year 2020: gross domestic product is expected to increase by 1.8%. These are the results of the Joint Economic Forecast for spring 2019, which will be presented in Berlin on Thursday. 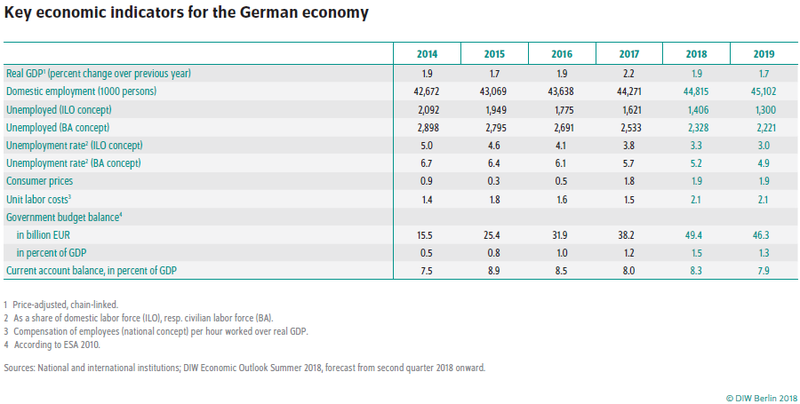 According to DIW Berlin estimates, the German economy will continue its solid growth performance in 2019 and 2020. Overall, however, the economy is cooling noticeably and production capacity utilization is returning to normal. This is primarily due to the global economy weakening; it has been strained by China’s weakening economy, trade conflicts, and political uncertainties such as Brexit. The German economy will be particularly affected by these developments, as it specializes in exporting capital goods. However, the German economy will likely gradually make up for its dip in growth, helped by the fact that private households have been benefiting from fiscal policy stimuli since the beginning of 2019 and the increasing signs of a recovery in the automobile industry. Nevertheless, DIW Berlin has lowered its growth forecast for the German economy to 1.0 percent for this year in light of the gloomier business expectations in many sectors. The outlook for 2020 remains virtually unchanged, however, with GDP forecasted to grow by 1.8 percent. According to DIW Berlin estimations, the German economy will continue to grow noticeably over the next two years. However, the economic boom is over as economic momentum is likely to cool off. DIW Berlin thus confirms its estimations from the late summer that the growth rate of the German economy is gradually returning to normal, overlaid by non-recurring effects. However, DIW Berlin is lowering its forecast for 2018 to 1.5 percent. At present, the economic situation is unusually unclear, partly due to developments in the automotive industry. Motor vehicle manufacturers are having major problems certifying their vehicles in accordance with the new exhaust and consumption standards. Certification is a prerequisite for selling their vehicles in Europe. As a result, fewer cars were sold both domestically and abroad in late summer, which led manufacturers to cut back production. This also curbed exports, investments in the vehicle fleet, and private consumption. The production losses are expected to be made up at least in part in the winter half-year. However, this forecast is subject to unusually high uncertainty: it is quite possible that there will be no further recovery and that the growth momentum this year and next will be weaker than forecast. At present, GDP is expected to grow by 1.6 percent in 2019. Frequently voiced concerns that the German economy will overheat are thus likely finally over. In 2020, the growth rate is likely to be 1.8 percent—but it will be a good 0.4 percentage points stronger due to a higher number of working days. Immigration from other EU countries increased Germany’s GDP growth by an average of 0.2 percentage points every year between 2011 and 2016—and for some years, such as 2015, the high point of EU immigration, by even more (0.3 percentage points). Immigrants filling open jobs increases overall economic employment, leads to additional consumer demand, and avoids bottlenecks in the labor market, which would have led to higher production costs and prices and reduced growth accordingly. These are the findings of Marius Clemens, economic researcher at the German Institute for Economic Research (DIW Berlin), and his co-author Janine Hart from the University of Potsdam, which have been published in their new study. According to DIW Berlin estimations, the German economy will continue on its current growth path over the next three years. This confirms the forecast from early summer that economic output will grow at a more moderate pace than previously. DIW Berlin’s forecast indicates growth of 1.8 percent for 2018, 1.7 percent for 2019, and 1.8 percent for 2020. In contrast to the strong export performance of the previous year, the domestic economy is now primarily driving growth, with both consumption and the construction boom as contributing factors. Thus, the labor market situation remains favorable and the unemployment rate is likely to fall below the five percent mark as early as next year. Wage increases are also stronger than in previous years and enabling households to earn somewhat more money—even after deducting inflation, which is now higher. In a systematic European comparison of taxes and duties on passenger cars, Germany is in the lower third – Taxes on passenger cars neither raise enough revenue nor provide sufficient incentives for less polluting passenger car traffic. Germany needs to reform its passenger car and fuel taxation and make a gradual increase in the diesel tax a priority. This is the conclusion reached by Uwe Kunert, a transport economist at the German Institute for Economic Research (DIW Berlin) who systematically analyzed and compared passenger car tax systems for 30 European countries (EU-28, Norway, and Switzerland) in a new study. “The comparison shows tax systems which vary greatly in their design, use many different assessment bases, and, as a result, have quite different tax burdens,” said Kunert. The total sum of taxes and duties paid when purchasing (value-added tax, registration tax and fees), maintaining (motor vehicle tax, insurance tax), and using (taxes on fuel) a new mid-size car with an annual mileage of 15,000 kilometers is between 1,200 and 2,000 euros for most of the countries surveyed. In countries with even higher tax totals, the registration tax—which does not exist in Germany—is the determining factor. Moreover, the sample calculation shows that in 26 countries, vehicles with a diesel engine have a lighter tax burden than those with a gasoline engine. According to DIW Berlin estimates, the German economy should grow by 1.9 percent this year and 1.7 percent next year. The GDP growth forecast has thus decreased by 0.5 percentage points for this year and by 0.2 percentage points for the coming year compared to DIW Berlin’s March forecast. Essentially, this reflects the markedly increased uncertainty concerning the economic policy environment that is affecting investment activity worldwide and curbing exports in particular. In addition, the start of 2018 was weaker than was expected in March due to some temporary factors: high rates of sick leave, broad-based strikes, and an above-average number of holidays. The Economic Barometer of the German Insitute for Economic Research (DIW Berlin) remains high but is signaling a weakening of the growth rate. It reached a score of 126 points in the first quarter and 121 points in the second quarter, well above the 100-point mark that stands for average growth. The German economy is expected to have gained a good 0.7 percent in the first quarter of 2018 compared to the final quarter of 2017. This is signaled by the Economic Barometer of the German Institute for Economic Research (DIW Berlin), which rose from 113 to 118 points. It is still well above the 100-point mark, which stands for average growth. Euro area states can benefit from an interest rate increase in the U.S. in the short term, according to the findings of a current study by the German Institute for Economic Research (DIW Berlin). Thanks to the devaluation of the euro, their exports would rise to the extent that they are able to overcompensate for the negative demand effect from the U.S. This holds true for Germany in particular. In the medium term, interest rates in the euro area would follow those of the U.S., leading to a decline in growth rates there as well. “The positive effect would only be temporary. But our findings should reduce concerns that a hike in the U.S. benchmark interest rate would result in spillover effects and weaken the euro area economically,” said DIW economist Max Hanisch. DIW Berlin president Marcel Fratzscher and co-authors Christian Franz and Alexander Kritikos analyzed the correlation between the Alternative for Germany’s (Alternative für Deutschland, AfD) performance in the last parliamentary election and seven economic and sociodemografic structural variables. Certain characteristics, such as the unemployment rate or share of non-German citizens in each electoral district, appear to barely play a role. There are positive correlations for other factors, meaning that these characteristics are especially pronounced in electoral districts where the AfD performed well. The patterns are different in the eastern and western parts of Germany. The average electricity prices for German households have been rising almost constantly since 2007, but the rise in retail prices has affected customers to different degrees. While the basic tariffs offered by default providers—the most expensive tariffs available—increased by 50 percent by 2014, the most affordable tariffs on the market generally remained unchanged. The default providers are legally required to sell energy in the form of a default tariff to all households in their respective service areas. If consumers would switch from a default tariff to a cheaper tariff from a different provider, they would save a lot of money. In 2014, assuming average power consumption (2,800 kilowatt hours per year), it would have been possible to save an average of almost 400 euros. Nevertheless, only a relatively small number of households switch providers. Every year in Germany, around 200 billion euros are invested in knowledge-based capital, such as research and development (R&D), software and databases, marketing and advertising, or technical design. These investments do not only increase company productivity, however. They also make investments in traditional capital goods, such as machinery or buildings, more effective. This is the conclusion reached by the German Institute for Economic Research (DIW Berlin) on the basis of a dataset containing almost two million official company records. “We found that, regardless of whether investments are made in R&D, organizational capital, or software, the positive effects on productivity are quite similar,” said Alexander Schiersch, who led the project. The German economy continues to soar: the German Institute for Economic Research’s (DIW Berlin) Economic Barometer is at its highest reading in seven years. The index score for the first quarter landed at 118 points, an increase of almost four points compared to the last quarter of 2017. The Economic Barometer is thus well-above the 100-point mark that corresponds to the long-term average growth of 0.3 percent. Accordingly, the German economy is likely to grow more vigorously in the winter—by an estimated 0.7 percent in the first quarter of 2018 after a 0.6 percent growth in the fourth quarter of 2017, in each case compared to the previous quarter. The 30 percent gender quota for supervisory boards is effective: the proportion of women on the supervisory boards of a good 100 companies in Germany which have been subject to the quota since 2016 increased to an average of 30 percent by the end of 2017, almost three percentage points more than the previous year. The German Institute for Economic Research's (DIW Berlin) Women Executives Barometer shows for the first time that numerous companies are increasing the proportion of female members serving on their supervisory board beyond the specified minimum.